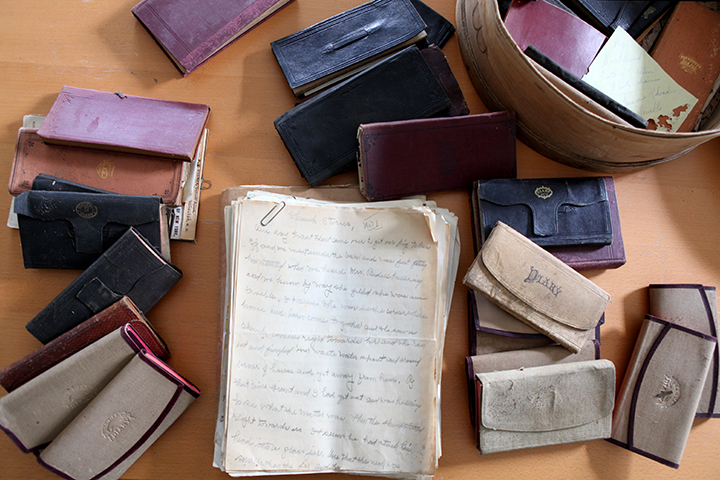 This October the Vermont Folklife Center Archive received a donation of 43 nineteenth and early twentieth century diaries created by members of the Flint family of Braintree, VT.
Flint Family Reunion, Braintree, VT 1899. 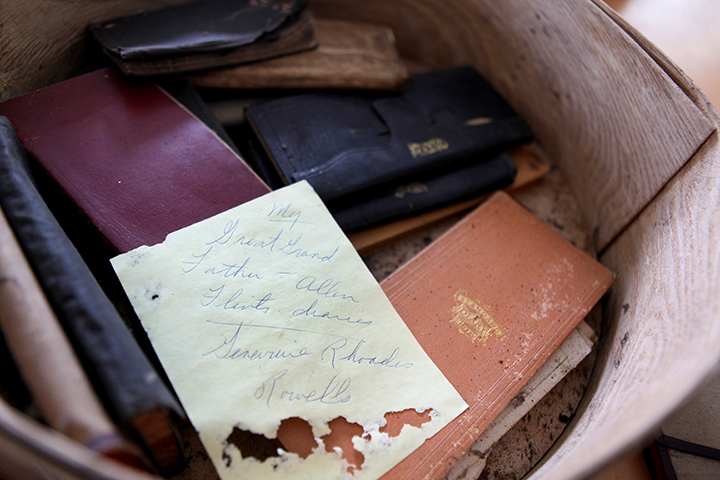 Flint-DuClos Family Collection. 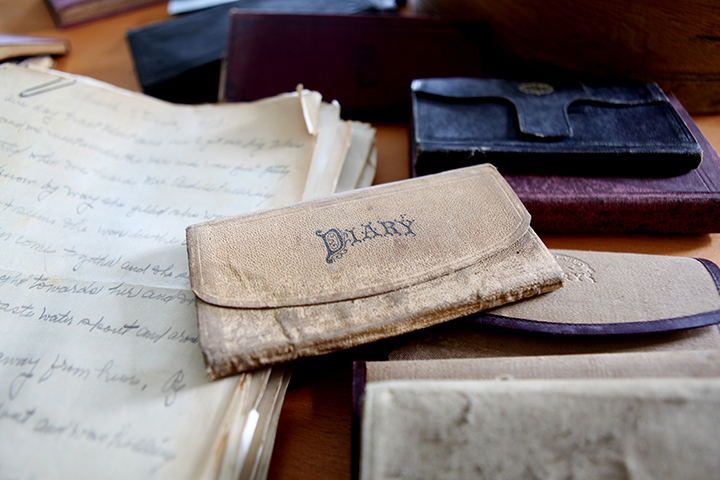 When we are approached with letters, diaries - and even business records and book drafts - that relate directly to audio recordings and other multimedia materials already in our collections, we see them as invaluable additions that add additional detail to the broad tapestry of experience documented by our archives. And in the case of the Flint family dairies, they further augment one of richest bodies of materials in the collection – extensive audio recordings and family photographs from the Flint family of Braintree, VT.
Perkins Flint in 1966. From the Flint-Duclos Family Collection. VFC Co-Director, Greg Sharrow lived for many years in Braintree where he became close friends with former school teacher and local historian, Katharine Flint DuClos (1907-2010). Katharine, daughter of local raconteur Perkins Flint (1878-1969), possessed an encyclopedic knowledge of the town - one gleaned across both her own long life as well as from the intricate web of stories about Braintree woven for her by her father. We have Greg to thank for sitting down with Katharine many times over the years to capture her astute observations on small town life in Vermont in the early part of the last century. And, in turn, we have Katharine to thank both for sitting down with her father in the mid 1960s to record his stories on tape, and for donating these tapes to the Vermont Folklife Center Archive. Katharine Flint Duclos. Photo by Jack Rowell. After Katharine’s death in 2010 members of her family passed on to us a rich collection of roughly 100 years of family photographs. 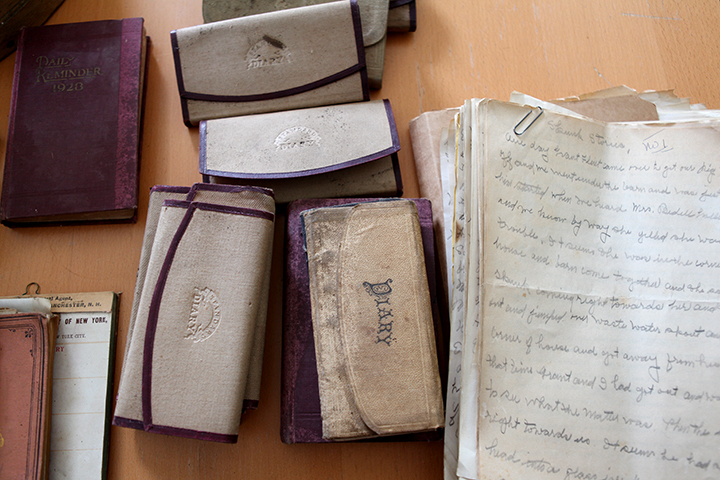 The diaries brought to us by Genevieve Rhoades Rowell fill in more detail on the Flint family, allowing researchers to see, hear and read about the experiences of the Flints and about life in a small town in central Vermont from the middle of the 19th century through the beginning of the 21st. The Perkins Family Dairies from the Flint-Duclos Collection of the Vermont Folklife Center Archive. Photos by Mary Rizos. To appreciate the storytelling gifts of Katharine and Perkins you really need to hear them, and thankfully you can. Below are selection of excerpts from Greg's recordings of Katharine and Katharine's recordings of her father. In this selection, Katharine describes how her family made and consumed hard cider. The Flint Family of Braintree, Vermont. A Final Note: Perkins and Katharine aren’t the only father-daughter storyteller pair represented in our archive. Daisy Turner of Grafton, VT (1883-1986) shared with Jane Beckthe stories of her father Alec Turner’s (1845-1923) experiences of plantation life in Virginia, the Civil War, and the establishment of a homestead in Vermont. We’ll feature Daisy and Alec in a future post. Newer PostNews from the Discovering Community Education Program! Older PostOur New Partnership with VPR!